Posted By Jennifer on June 28th, 2012 at 4:09 pm | 568 comments. 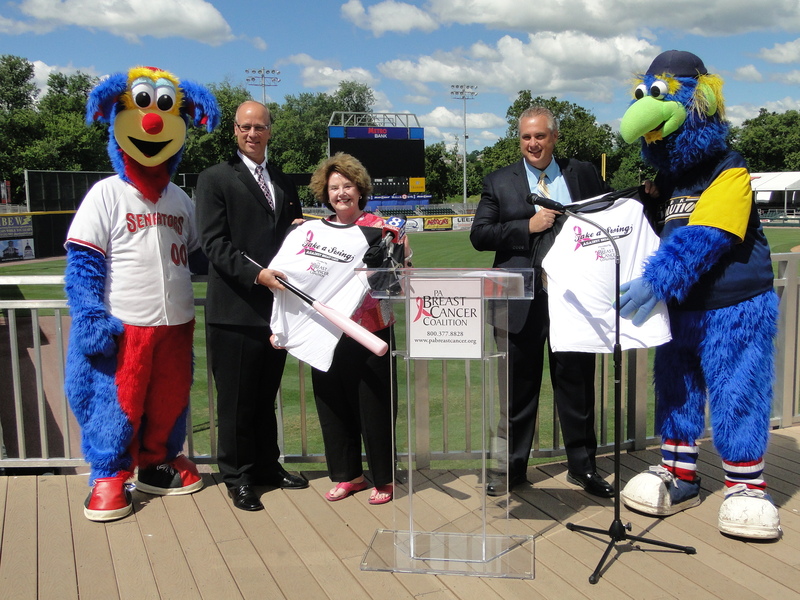 The PBCC held a special event at the Harrisburg Senators Metro Bank Park to announce our 5th Annual Take a Swing Against Breast Cancer home run derby series, coming to eight minor league baseball stadiums this July. Senator Mike Brubaker from Lancaster County, PBCC’s President and Founder Pat Halpin-Murphy, and Harrisburg Participant Rob Ziemba rallied together along with mascots Rascal and Downtown to kick-off of the event series and celebrate the past successes of the event. Starting off on July 10th in Harrisburg, the PBCC will be counting grand slams, adding up points and crowning a winning team, all in the name of breast cancer awareness and support. Grab a group of friends, family or coworkers and be a part of this unique series of events. Visit www.PAHomeRunDerby.org to view the full schedule of events and sign up to participate. Hurry, we hit the road in just 12 short days! Posted By PA Breast Cancer Coalition on June 22nd, 2012 at 9:52 am | 5318 comments. Harrisburg, Pa. – The summer heat of August may be three months away — but a new fundraising partnership is already burning up the pavement for a statewide non-profit organization. The PA Breast Cancer Coalition (PBCC) recently teamed up with Lebanon-based Bill Martel Racing to promote breast cancer awareness and education at the NASCAR Camping World Truck Series Pocono Mountain 125 and The Pennsylvania ARCA 125 – Presented by Menard’s. 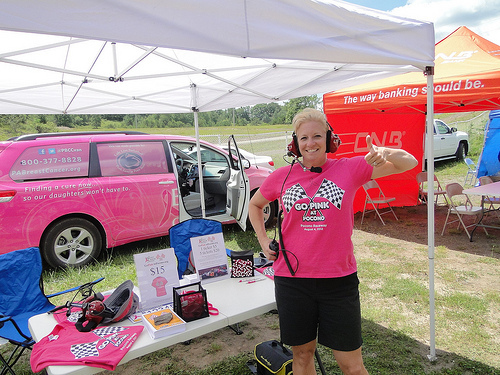 These events will take place during the first weekend of August at The Pocono Raceway in Long Pond, PA.
Go Pink at Pocono benefits the PA Breast Cancer Coalition and event organizers are searching for supporting sponsors to join them in victory lane. Multiple sponsorship levels are available and include race car and race truck logos, event tickets, pit tours, driver meet-and-greets and more! Inaugural Go Pink at Pocono race t-shirts will also be for sale and are sure to be a hit. Race veteran Kyle Martel of Lebanon will drive one-of-a-kind pink vehicles during two events at the Pocono Raceway. To sponsor Go Pink at Pocono, and to request additional information, please contact Rob Ziemba at rziemba@hanovercoldstorage.net. For more information about Bill Martel Racing, visit www.kylemartel.com. The PBCC represents, supports and serves breast cancer survivors and their families in Pennsylvania through educational programming, legislative advocacy and breast cancer research grants. The PBCC is a statewide non-profit organization dedicated to finding a cure now…so our daughters won’t have to. For information call 800-377-8828 or visit www.PABreastCancer.org. Posted By Jennifer on June 15th, 2012 at 10:24 am | 2137 comments. HAZLETON, Pa. – The PA Breast Cancer Coalition (PBCC) announces its partnership with the Luzerne County Exhibit Committee to bring its traveling photo exhibit, 67 Women, 67 Counties: Facing Breast Cancer in Pennsylvania, to the Hazleton Health and Wellness Center from June 14th through June 24th. An opening reception is scheduled for Thursday, June 14th at 6 p.m. The exhibit and reception are FREE and open to the public. To RSVP for the opening reception, please call 800-377-8828 x304. This work of art features women from each of Pennsylvania’s 67 counties, along with a message about how breast cancer has touched their lives. The women reflect the diversity of Pennsylvania, and their stories show the impact of breast cancer on themselves, their families and their communities. The exhibit encourages women to learn about early detection and celebrates life, courage, hope and the dignity of women and families who have battled breast cancer. 67 Women, 67 Counties: Facing Breast Cancer in Pennsylvania is sponsored by the PBCC and funded by the Pennsylvania Department of Health. Posted By PA Breast Cancer Coalition on June 15th, 2012 at 9:02 am | 991 comments. In 1999 I fell into both categories. What showed up in my mammogram looked like salt sprinkles which are calcifications. My doctors offered me two choices, a mastectomy or lumpectomy with six weeks of radiation. Then it was time to call my daughter-in-law Heather. Heather said I should get a second opinion. I went to Fox Chase Cancer Center where they strongly recommended the mastectomy. My head was spinning. I didn’t have any knowledge about this so listened to the people who did. My advice is to always have someone else in the room with you when you’re going to hear about treatment options. I was in a fog but my husband Glenn wrote everything down and read it back to me later. I had the mastectomy and I use a cotton-filled prosthesis. It feels like rice pillows and I’m comfortable with that. Glenn always made me feel attractive and desirable and that nothing had changed. I don’t know what I would have done if he looked at me differently. My sons were a huge support to me and I can never thank them enough. Give yourself the gift of savoring the moment. Smell a rose, hug a pet, kiss your husband. Don’t live in the land of “what if?” because “what if’s” don’t prepare you for the future. Most “what if’s” never happen. Open yourself up to other women. Their beauty, strength, and caring will lift you up. I retired from teaching English at Cornwall Lebanon School District in 2003. Now I work with Three Dog Landscaping, a family business. I love reading, taking day trips, and spending time with my 6 year-old granddaughter Molly. Posted By PA Breast Cancer Coalition on June 15th, 2012 at 9:01 am | 1627 comments. Congratulations to Dr. Andrea Mastro of Pennsylvania State University for her continuous work in searching for a cure! After submitting a proposal to the Department of Defense, Dr. Mastro was awarded the Breast Cancer Research Program’s Idea Award along with a $500,000 grant. The award emphasizes innovation and high-impact research that not only challenges the scientific community, but addresses the primary goal to end breast cancer. Dr. Mastro also received a PBCC Refunds for Research Award in 2003 and has been an active member of the PBCC Board since 2005. Posted By PA Breast Cancer Coalition on June 15th, 2012 at 9:00 am | 215 comments. PBCC’s traveling photo exhibit, 67 Women, 67 Counties: Facing Breast Cancer in Pennsylvania, continued its spring tour at Central Penn College in Cumberland County and Guthrie Clinic in Bradford County. Check out this video highlighting the exhibit. Currently, the photo exhibit can be seen at the Hazleton Health & Wellness Center in Luzerne County through June 24th. All locations held opening receptions where local leaders, doctors, breast cancer survivors and exhibit participants spoke about the importance of the exhibit and its message of early detection and awareness. If you are in the Hazleton area, stop in and see this educational work of art that focuses on each woman’s personal perspective on battling breast cancer.